The first reward for delaying our departure till daylight came just minutes after we left Negreira. 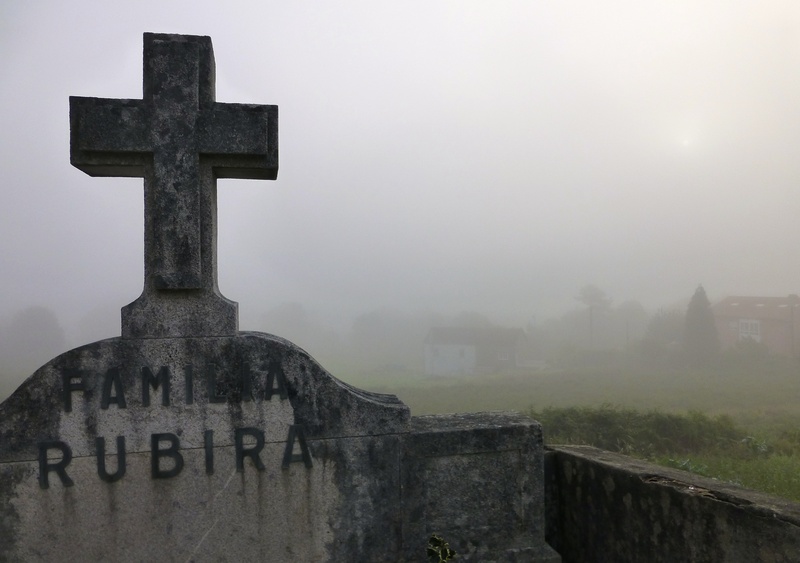 Thick morning mist swirled and dipped around the church and graveyard of San Xulián up on the hill, luring us off the path and in through the gothic gates of the cemetery. The Galician style of stacking graves five storeys high means they tower dramatically above you while the plastic flowers and marble feel cold, regimented and forbidding. There’s very little green here, other than the wild flowers that have found a foothold, so they’re very different to the warmth of the graveyards I know. These feel much more final. We spent an hour here, reading names on stones, enjoying the shady shapes and taking photographs, while the sun tried in vain to force its way through the mist. When we left we climbed steadily upwards and looked down from the warmth of sunlight into misty valleys. 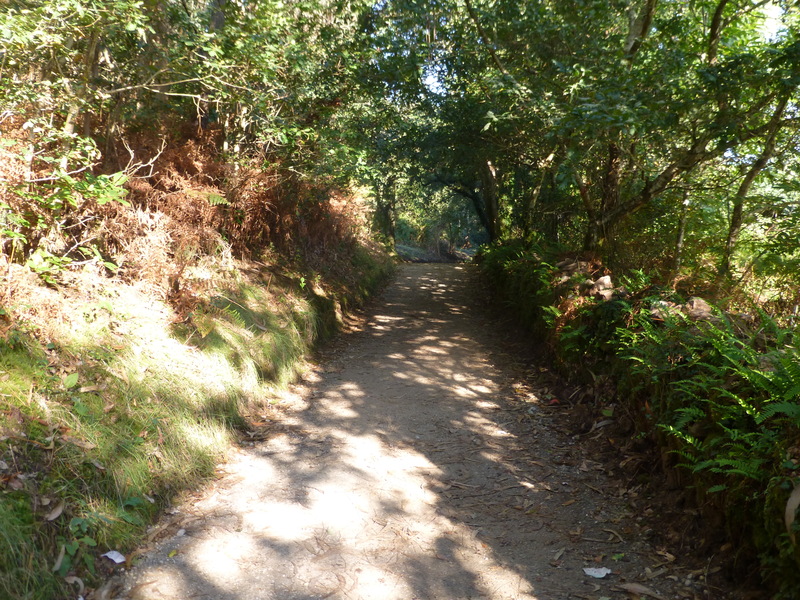 There was no rush on wooded, gentle paths, but by the time we reached the first cafe in Vilasarío it was late and we had walked 13k so we were hungry for breakfast, a delicious Spanish omelette of onion and potatoes with bread and cafe con leche. I love the traditions of the camino, the immediate peeling off of socks and boots to let overheated feet breath and recover while you eat and drink. No one turns an eye. We had decided to take four days to reach Finisterre and were meeting our friends in an albergue in Santa Mariña in the afternoon, but a couple of kilometres before we reached the village I turned a corner to find a bridge over the rio de Maroñas, and my friend Helen already paddling in the cool, clear water. 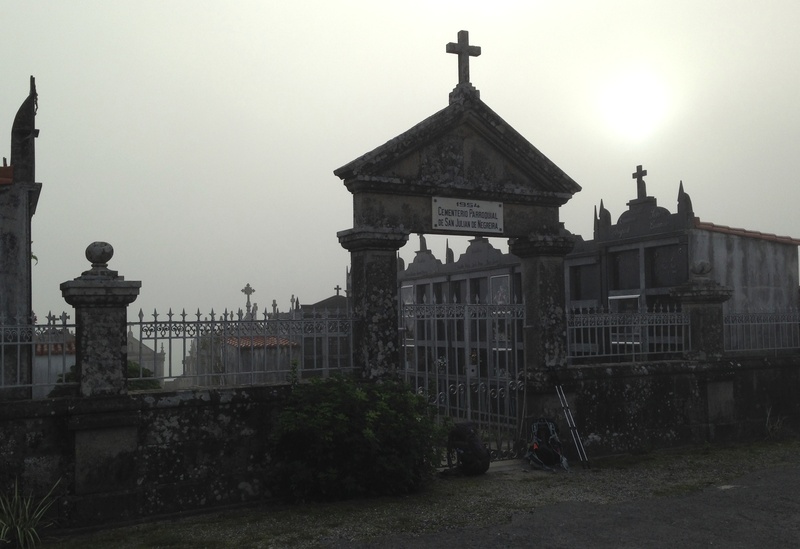 Rucksacks and schedules were abandoned; we didn’t care if the next albergue was full and other pilgrims took our beds. The restorative power of icy water meant our legs and feet were fit for at least another 20k if necessary. The old albergue in the centre of the village looked welcoming and the hospitalero was keen for our euros, but we searched the rooms in vain for our Irish and Australian friends and trooped off, a little disappointed, to the noisy place on the busy road where we were served cabbage and bean soup and will be sleeping in a low room with mouldy walls. Rehydrating on cervezas and an evening of laughter – not least about the dubious contents of the washing line – made up for the tastelessness of the poorest pilgrim menu I’ve ever encountered. Not everything on the camino is perfect but accepting what comes your way is part of this experience. Loving your updates Nancy, I almost feel I’m there with you!